After our Voodoo gear blog from a few weeks ago (which you can read here if you haven’t done so already) we decided that it would be nice to talk about the other key thing that can make or break a guitarist: technique. Because having the best rig in the world is not going to automatically make you sound like the world’s best player. In fact, put the world’s best players on a $100 guitar and amp package bought from a random online box shifter, and they’ll still sound amazing. But why is that? Well, think about it. Although our guitars and amps usually have an array of tone knobs and selectors, we all have (well, the vast majority of us at least!) ten tone fingers and thumbs that are just as important when it comes to making our music sound great. If we haven’t got the feel and the touch, then no matter how much we spend on our setup, there’s going to be a limit to how good we can sound. That’s what those great players all have: the technique and finesse to sound great, no matter what they’re plugged into. And it probably took them years, decades even, to sound that good. Practice makes perfect, after all. So, without further ado, here are some tips on how you can get honing your guitar technique – follow them, and we bet you’ll find your tone improving faster than a Paul Gilbert riff on steroids! It’s not just the equipment that makes the player. Your technique is equally important, so it’s crucial you get the basics right before you move on to more complex exercises. If you don’t, no amount of expensive gear is going to help you sound good! Simple, but crucial. Your fretting hand should be open, as if you were holding on to a tennis ball. Try to avoid the palm of your hand touching the bottom of the fingerboard/neck, to allow the upper notes of chords to ring out properly. It’s important to play behind the fret for the note which you are trying to sound. 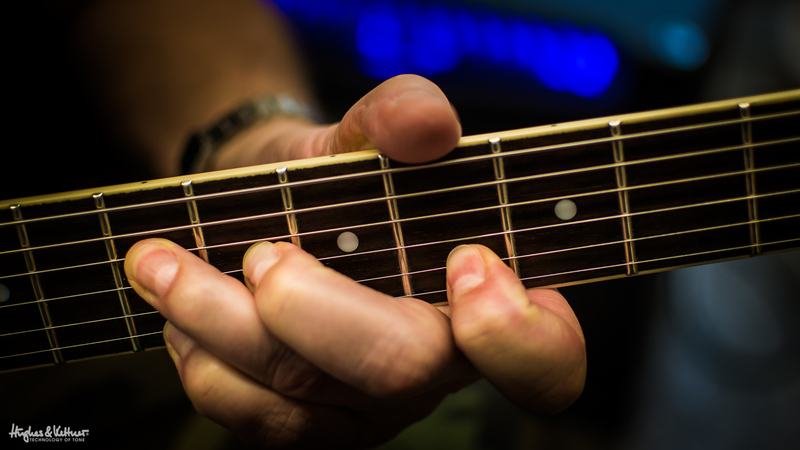 Try to leave space between your finger and the fret to get the most clarity out of the notes you are playing. Playing too close to the fret can dull the sound. If you’re a complete beginner, right in the center between the frets is a great place to start; you will adjust your position based on what chord you are playing, the size of your hands, etc. Try to make powerful, positive contact with the fret without bending the string out of pitch. A combination of right and left hand muting is essential to achieving great tone. When playing chords, muting strings that are not actually in the chord shape is essential to achieving a big, rich, and in-tune sound. While playing lead, the tone will be clearer if you are able to mute unwanted strings. 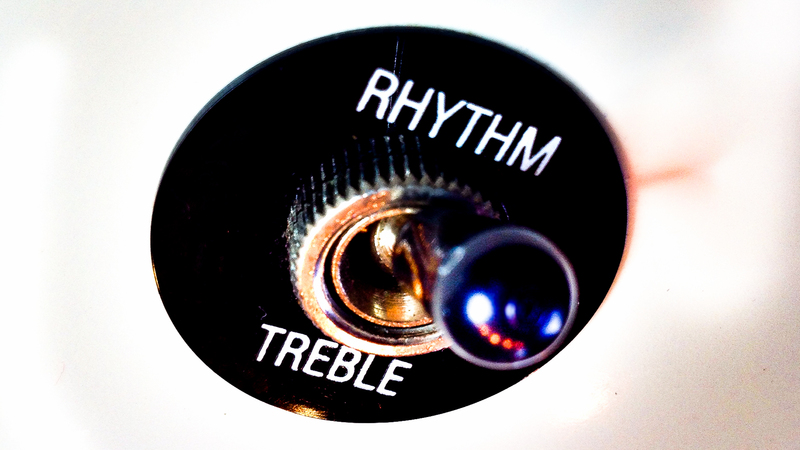 Finding the right balance between right and left hand muting will help each note or double-stop sing on its own. So, experiment! Both the side of your picking hand and the unused fingers of your fretting hand can be helpful in taming the beast and cutting down extraneous string noise. Here’s a short video of the aforementioned Mr. Gilbert explaining how he does it! This one seems obvious, but playing a really fast lick or passage before you’re ready for it can be tone-destroying. Slow down. Set your metronome to 90 bpm and practice the lick slowly, in time and repetitiously. If it’s a 16-note passage, trying playing 8th notes for a time instead, still at 90 bpm. This may seem boring to many guitarists, but this is a surefire way to get even the most advanced player picking the lick of doom more precisely and thus achieving great tone. As you get more comfortable, increase the tempo until you’re up to speed. You’ll be amazed at the improvement of your tone when you’re able to hit every note cleanly! And don’t forget your right and left hand muting! Get to know all of the sounds your instrument can produce. Does the song require a Tele, Strat or a Les Paul? If it calls for a Strat, what pickup(s) should you use? If it’s a Les Paul number should you use the bridge pickup, neck pickup, or both together? Knowing your instrument intimately will go a long way toward copping an authentic tone, especially if you’re trying to recreate tones from your favorite records or players. Experiment with tone, volume controls and the pickup selector switch and get to know your guitar as well as you can. Knowing how to play the same lick in several different places on the fingerboard can help you determine which sounds best. A two-note melody played on the G and D strings will sound different than the same two notes played only on the B string, for example. Learning where these note overlaps occur will help you make the right decisions for you based on what you like to hear. Do you dig a fatter sound, or a more stinging sound for that blues lick you just wrote? Fatter strings produce fatter tones, but is that what the lick calls for? Learning every note on the fingerboard can help you find the right position and tone for your lick. Of course, get to work on all of those intervals, chords, scales and arpeggios too! Whose tone do you like? Whose tone do you dislike? A lot can be learned from listening to your six-string heroes. Conversely, a lot can also be learned by listening for things you DON’T like! Are you a Cream-era Clapton fan, or do you prefer Sonic Youth? Could you play those Clapton licks with Thurston Moore’s fuzz tone? Open your ears and learn! Most of us pick up the guitar because we want to sound like our musical heroes. The next step is buying the same guitar and amp setup as them, but the one thing we can’t pay for over the counter? Their technique of tone! Dig in and have fun! Like we said, all the great gear in the world won’t help you if you don’t put in the effort. Some of these concepts take patience, practice and a lot of hard work to master. Learn as much as you can by listening. Record yourself. Be critical of yourself. 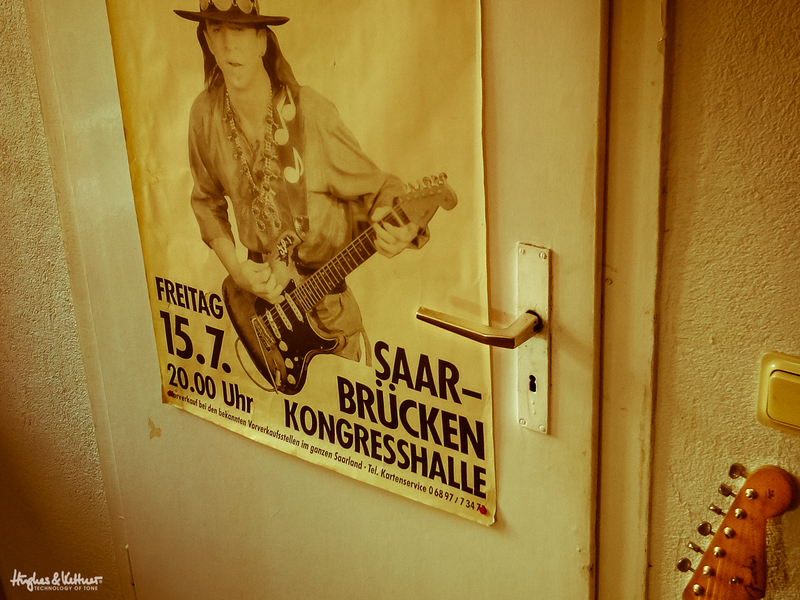 But most of all, have fun and explore the many different tonal options we as guitar players have. We’re lucky to be able to play one of the most expressive instruments on the planet! First published: September 19 2014. Most recent update: October 02 2015. Lee on When could, would and should you replace tubes? I really liked the detailed information shared by you. As a beginner I am looking for some tips, so that I can start guitar playing with perfect posture and pick. I do not have any tutor. I only have an old Gibson guitar, which I have recently repaired by installing parts for Gibson guitars. My elder sister’s instrument. I am trying to follow your tips. I hope I will learn something. Thanks for the kind words Nethan, glad you found the blog useful! I think its a real integrity move to have an article highlighting the importance of technique and skills when it could have been so easy to promote your really quality products. Pat on the back. 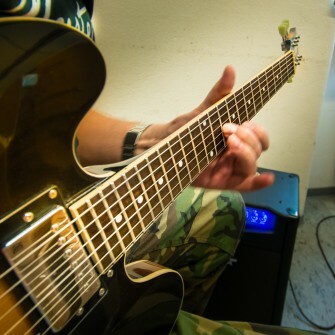 Its really easy to get focused on gear acquisition when it comes to improving tone. I’m guilty for sure. Its absolutely true that great tone comes from the individual, not just the gear. I’m thankful that when I started lessons at 10 years old that my guitar teacher Bob Pheiffer insisted that I learn on an acoustic guitar. It eliminated a whole lot of potential distractions like fx pedals, guitar amps, special cables, new pickups etc. That one decision allowed for me to focus on the fundamentals and gave me a whole lot of motivation to continue. You need high quality, quick and regular feedback to gain proficiency quickly on any musical instrument. 1. At the end of each practice session, make a video recording of yourself (with your phone or laptop) of you playing what you practiced (song, scales, chord patterns) to a metronome. 2. Always review the last practice session’s recording as the first step in your next practice session. It’s like football, hockey, and other sports — they always watch the game afterwards to look for things they missed in the heat of the moment. It’s the same principle for playing guitar because it requires a lot of hand coordination and listening ability. Make sure to capture the entire guitar in the frame of your camera so you can see where your hands are, your posture, etc. Listen to the sound… Where are the calm notes? Did you drop the beat? It’s very important to always practice with a beat (metronome, drum machine etc.) and to be in tune (use a guitar tuner). 3. Spend time with a good teacher if possible, they will be able to correct things and teach you things that can only happen in a face to face medium. Cheers for this feedback Jared – these are some really useful points that we hope fellow readers of this blog use. It’s amazing how helpful it can be to record yourself and listen back – shows you straight away what you need to be working on next time, anbd although it can be a painful experience at first, it sure does let you know where you are with your playing and what you need to improve on! Cheers Brian, and hope it proves useful for you! Thanks David, and we hope it helps you with your playing! Play a note right behind the fret with the least amount of pressure required to get a clear note. Maintain that pressure but move away from the fret, you’ll notice that it will start to buzz and/or mute completely. 95% of the time a beginner plays a note and gets a buzzing, horrible sounding note it’s because they’re playing too far away from the fret. Unfortunately their first response (unless told otherwise) is to push down harder which then leads to them forming the habit of playing much harder than they need too, which has big ramifications. If you want a consistently clear note time after time then play right behind the fret, always aiming to feel the fret ever so slightly against the side of the finger. This gives you a much more precise target every time and results in greater quality and consistency of tone. Hopefully with the added benefit of developing a light touch. Another added benefit for beginners is this encourages greater flexibility over time if they know they have to aim for right behind the fret. Also it empowers them as they know if they get a horrible buzz, they just need to move the finger closer. Matt, this is really good and detailed advice – as close to the fret without touching it is great, especially for single notes. Chords are a different kettle of fish, of course, but you still want to get the foremost finger as close in as you can. Thanks for the input, whihc should prove nice and motivating for beginners. Pressing too hard is certainly not the way to go!